It has been a beautiful spring so far in Southeastern Wisconsin. Yes, we have had some chilly air here and there. But overall things are right about where they should be. I find some comfort in that. After enduring winter’s bone-chilling cold and colorless landscape, it’s feels so good to know that once again Spring has arrived and the promise of another season of growth and life is now here. The spiritual message of all this Spring wonder is not lost on me. I’m reminded of life eternal each year, and that only through death can we truly gain life. I don’t want to forget that, even in the giddy excitement of planning and planting the garden and observing the world as it comes back to life. Here is some photographic evidence that the month of June is here at my house in all her glory. I’m sure the story is similar in countless backyards everywhere. By the way, you don’t have to have a garden to enjoy the sight of wild asparagus on the side of the highway or gorgeous green leaves upon the trees. Go find your own evidence, pretty much anywhere you look right now. And enjoy! It only comes once a year. 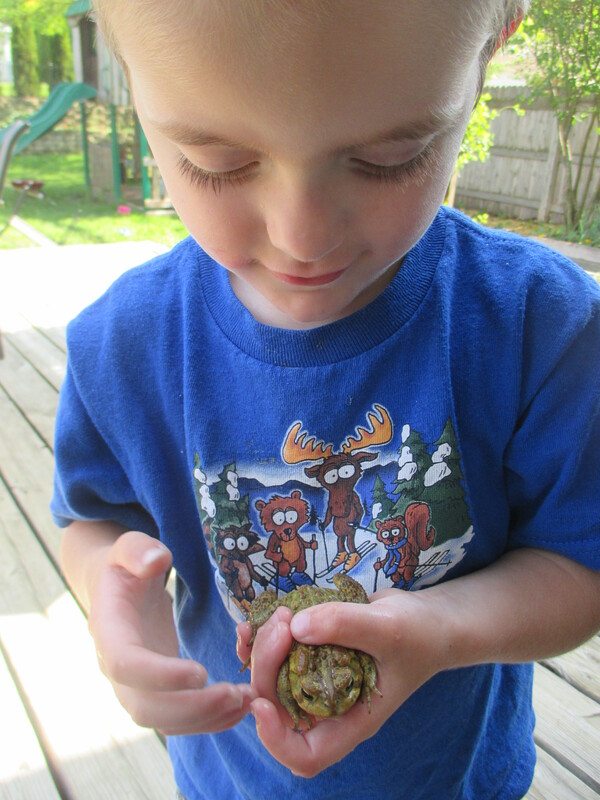 A boy with a frog. Love these critters in the garden where they eat slugs and other bugs I don’t want hanging around. Found this photo on my camera. 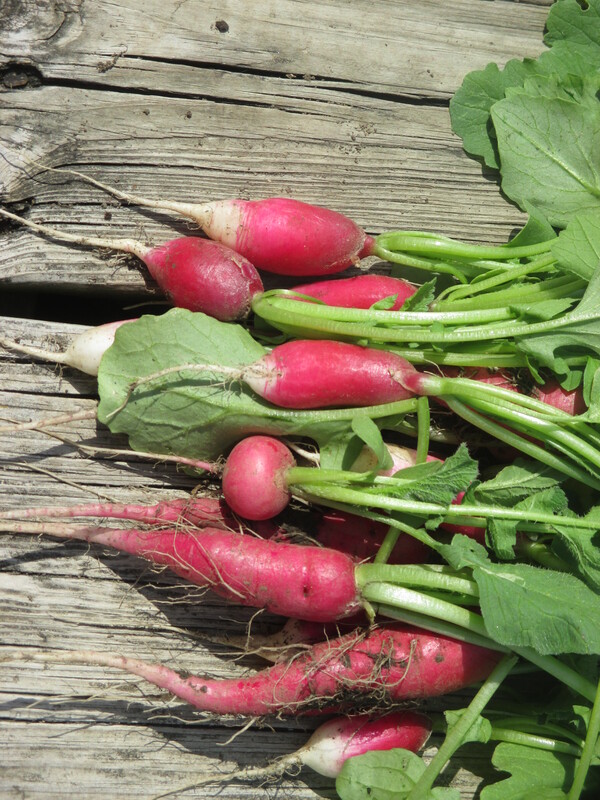 My kids picked these radishes and then photographed them. Wonder where they would get such an idea? 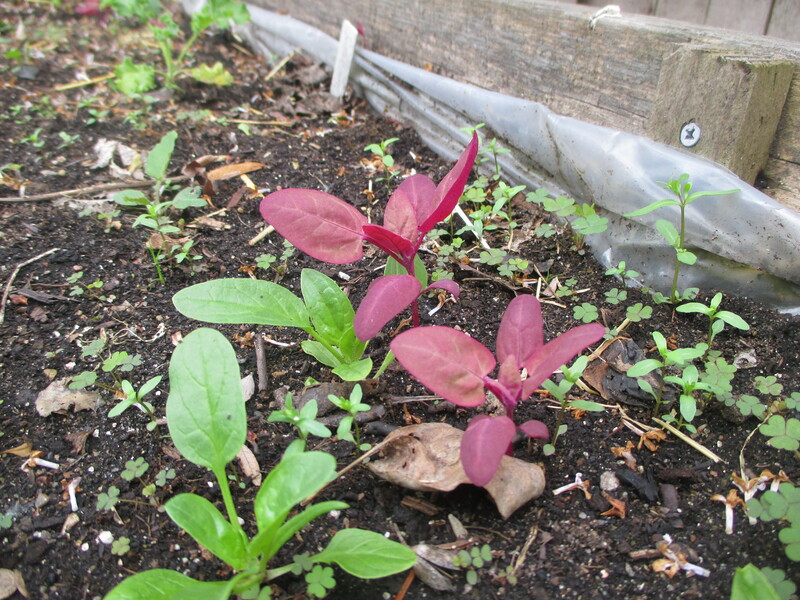 A peek at the red orach which seeded itself from last year’s planting. The color is outstanding. 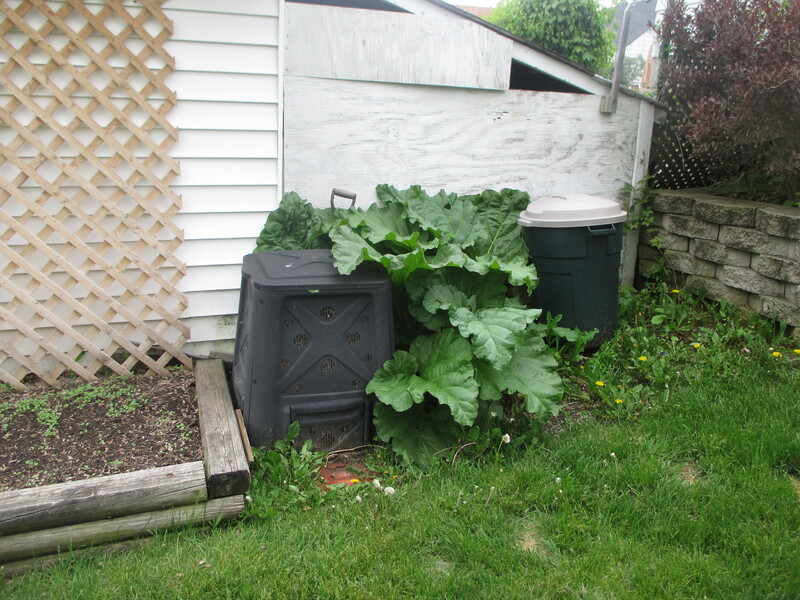 Giant stalks of rhubarb awaiting some yummy recipes. 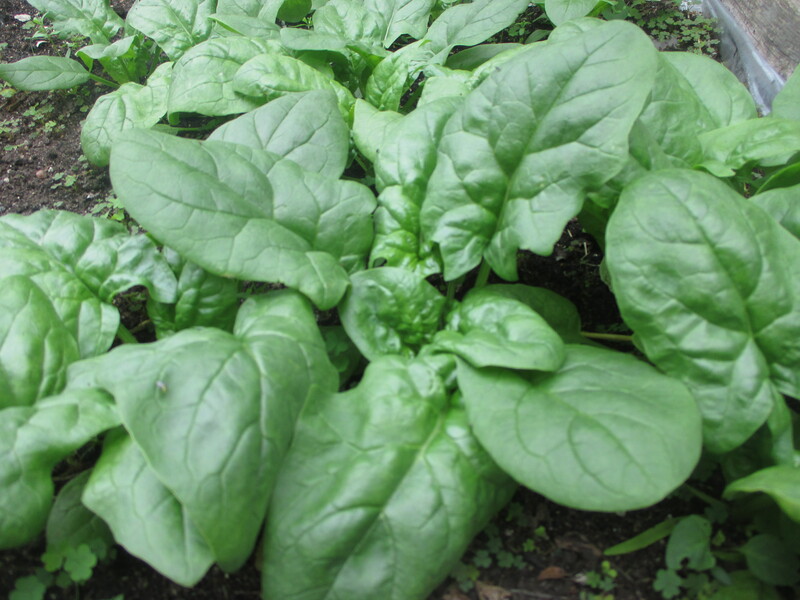 What a beautiful crop of spinach we are enjoying this year. The best ever. 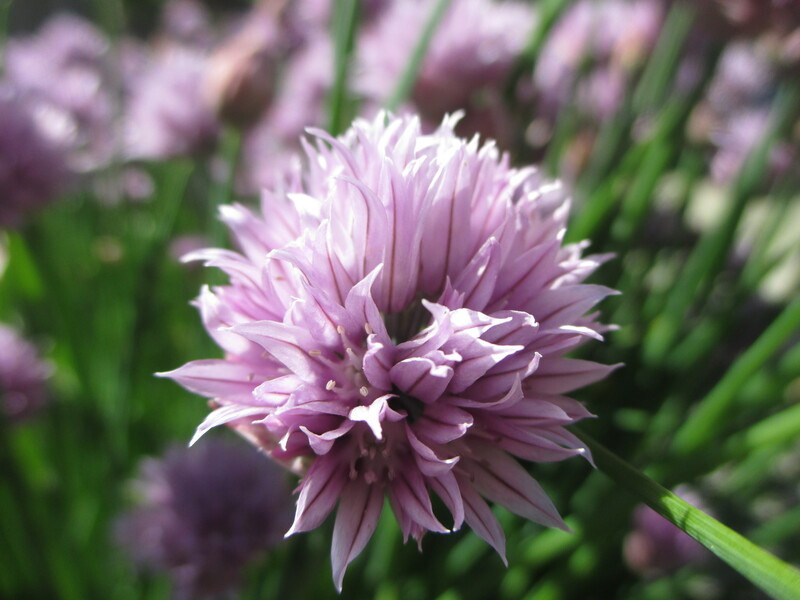 Chive flowers are now open and attracting something new this year–honey bees! I wonder if a neighbor has a hive? This year’s tomatoes freshly potted. Here’s hoping for a good tomato year. 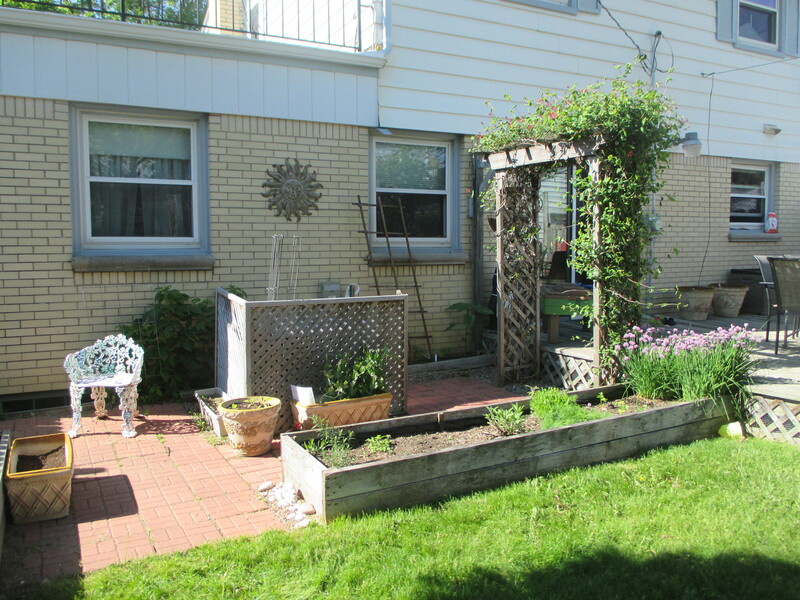 Patio with herb garden. Perennial herbs are now up and getting leafy. I should be able to start enjoying all of them soon. 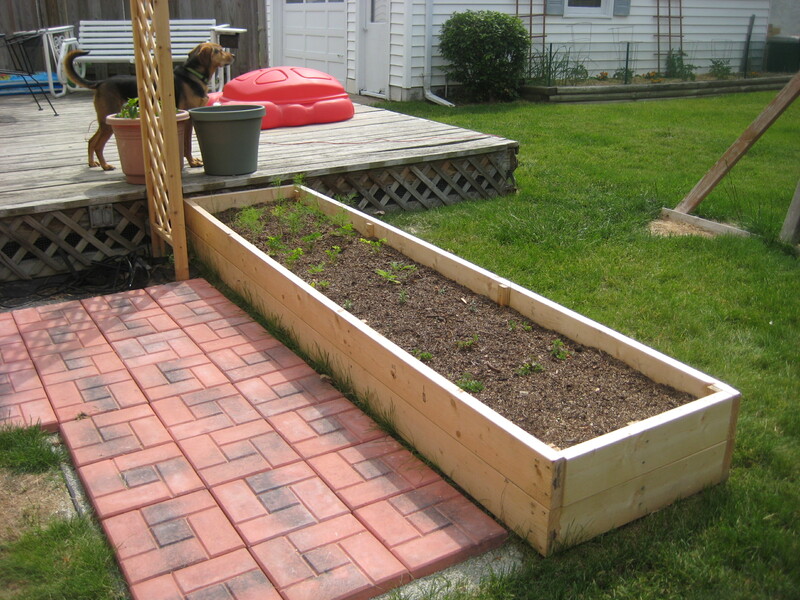 This raised bed will be featuring the following this year: garlic, onions, borage, spinach, arugula (already done), red orach, kale, Swiss chard, eggplant, marigolds, dill, and one volunteer head of lettuce. It’s a warm, sunny, October day here in Wisconsin. Cooler temperatures are on the horizon, but for today we will enjoy the warmth and sunshine for yet another day. As I reflect on my summer (which I realize remains a mystery to readers as it’s been months since I’ve posted) I feel thankful and satisfied with what was accomplished. 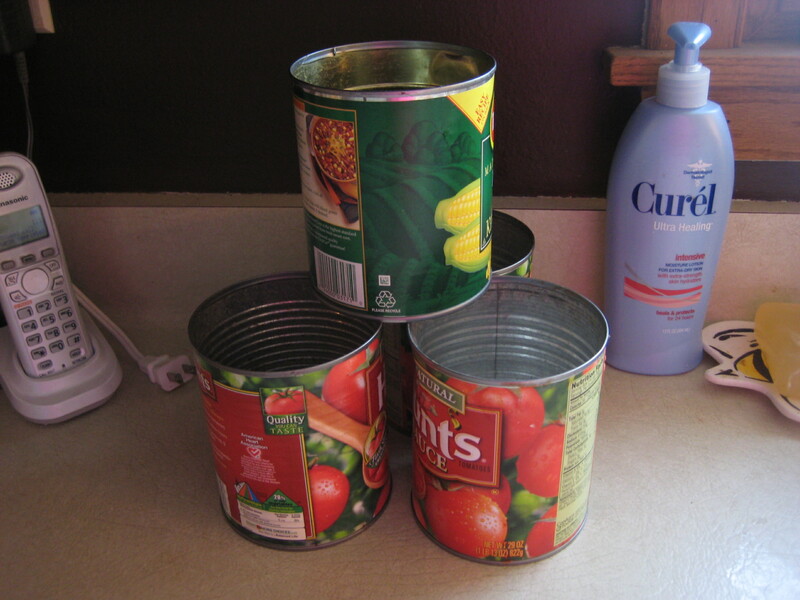 I set out with a vague goal of preserving more food this year than I ever have before. I knew that I would grow some of that food. And that I would buy some of that food from farmers. You might be wondering what has been grown, purchased and preserved this year. As a matter of fact, I was wondering that same thing this morning as I pulled out a jar of peaches and thought how nice it would be to have an inventory of some sort. Here is a list–with and without amounts–of what I worked on this summer. 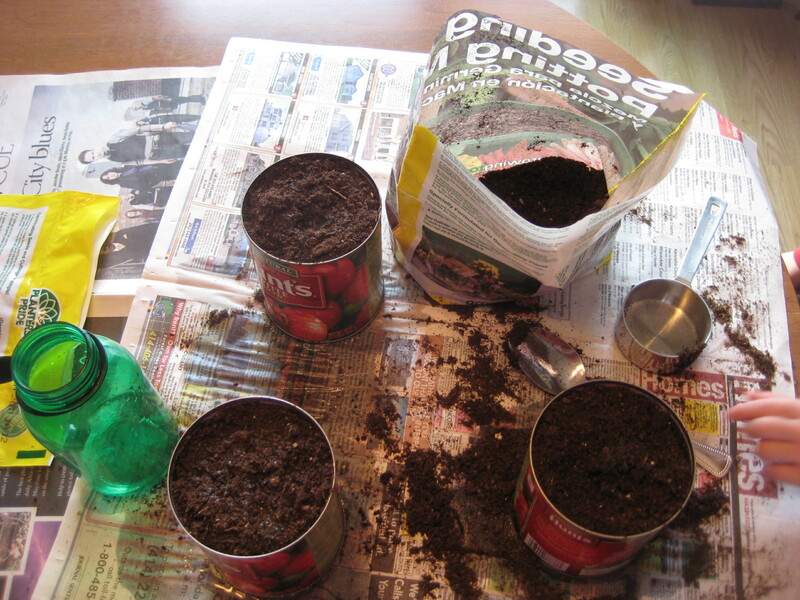 I hope it inspires other urban gardeners to try some preserving. Nothing here is exotic or difficult to do, just good ol’ jars of food and stuff in my freezer. Meanwhile, we’ve eaten countless salads and tomato dishes out of garden. We’ve eaten mountains of kale chips. My kids have a habit of eating raw beans, peas and carrots straight out of the garden… in fact these things never make it in the house. 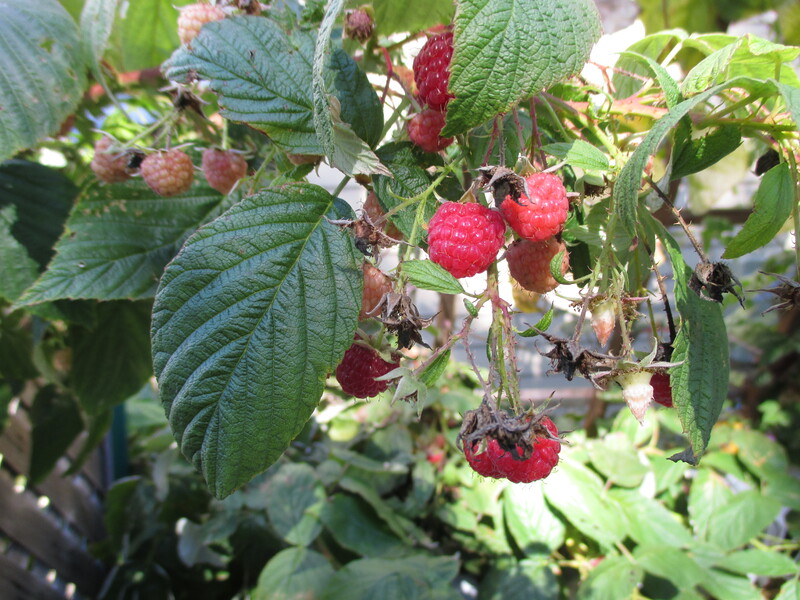 Every day we look forward to our raspberry snack, straight off the canes outside. We put fresh herbs on all of our meat and fish, make salad dressing with our herbs and use them in mixed drinks. This year we enjoyed fresh garden onions for the first time. We made fresh juices with our celery, cucumbers, kale, parsley and other fresh garden goods. It’s the second week of October and we still have much to look forward to. There are tomatoes on the vine. If a frost threatens, I can pull off the green ones and let them ripen indoors. Until then, bruschetta and salsa awaits! And probably a few more BLT dinners (our favorite). 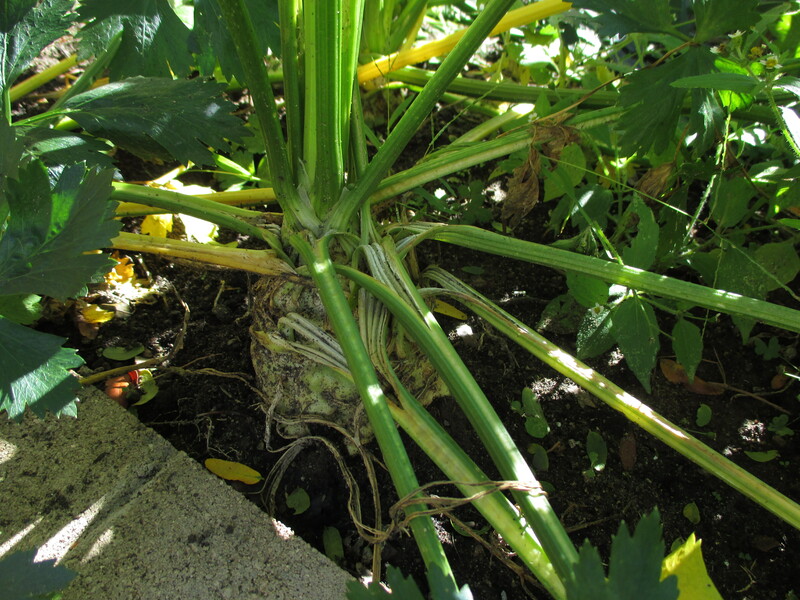 Celeriac is ready to harvest and be transformed into a delicious soup. Leeks are large this year and ready to be used in a leek and potato soup, as well as other applications, such as our Christmas ravioli filling as we’ve done in the past. 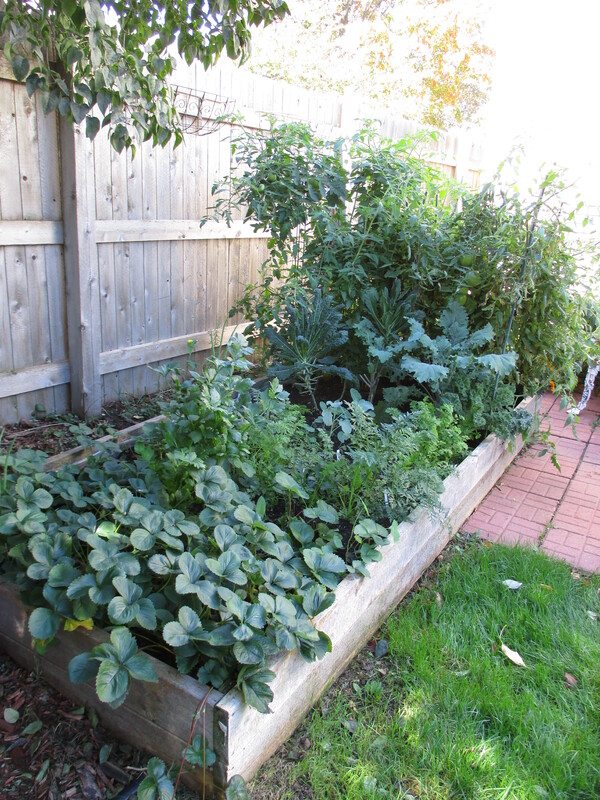 There is plenty of swiss chard and kale, the latter of which will continue to grow until it gets very cold. Raspberries continue to ripen each day and the eggplant has hit a stride that I find hard to keep up with at this point. I have such good luck with eggplant. 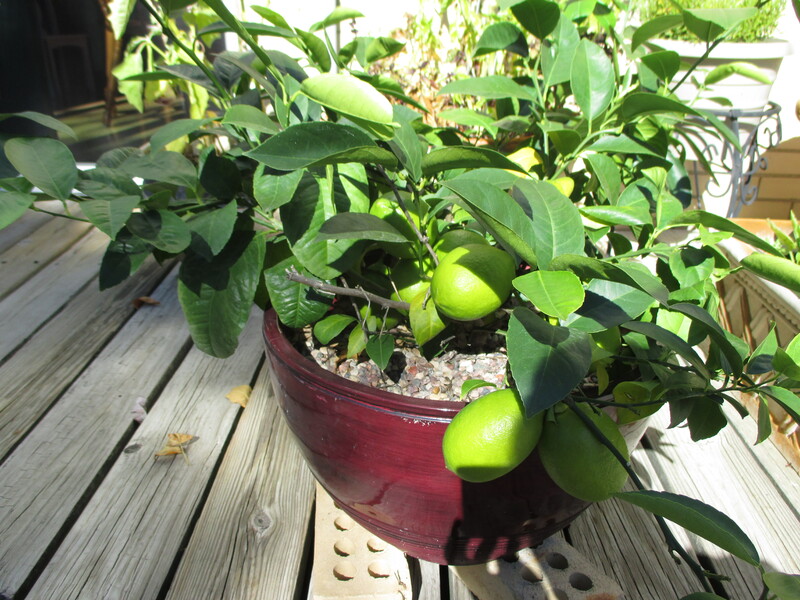 Perhaps the most interesting thing in this year’s garden is the lemon tree. So many big, beautiful lemons! They are turning yellow now and will be perfect stuffed into a chicken for roasting or in salad dressing, on fish, in tea, or on my favorite lemon garlic pasta recipe. What a blessing to finally get some lemons off that little tree. I garden in a small city sized lot. I squeeze a lot in to my small space. Not everything grows, not everything is a success. That’s okay. I’ve learned much from my garden failures. At the beginning of the season I prayed over my garden as I planted it. 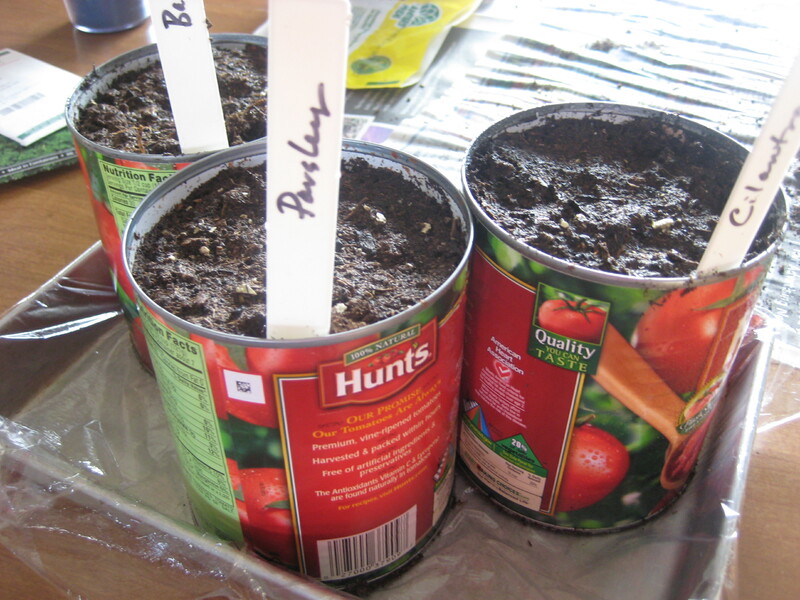 “Dear Lord, if it is your will let this garden nourish us this year. Make it grow!” God delivered. I’m not a perfect steward of these blessings (oops, I’ve had to toss a few things I let go past their prime in the compost), but thankfully God doesn’t withhold His blessing just because I make some human mistakes. I’m so glad He gives me the opportunity to keep trying and keep learning. So, for now, my larder is full! Praise God. 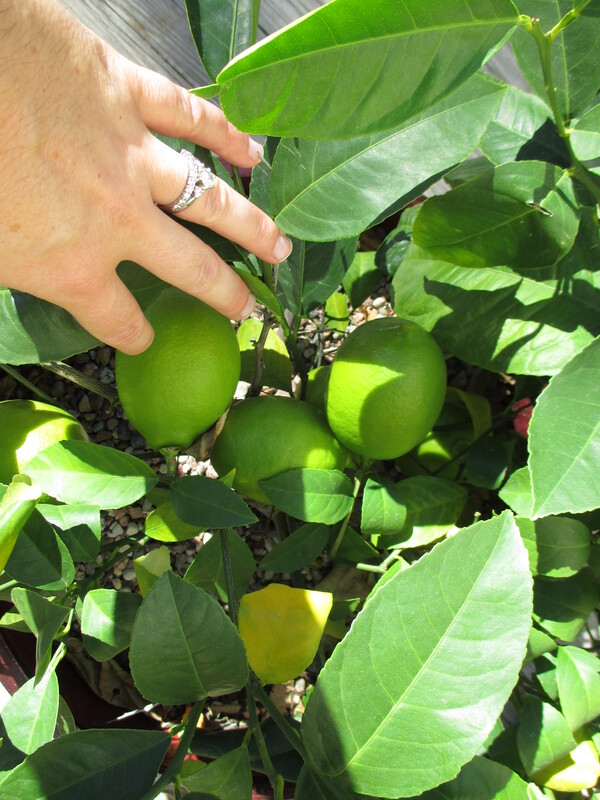 Dwarf Meyer lemon tree has been working on growing these lemons all summer. The lemons are beginning to turn from green to yellow. 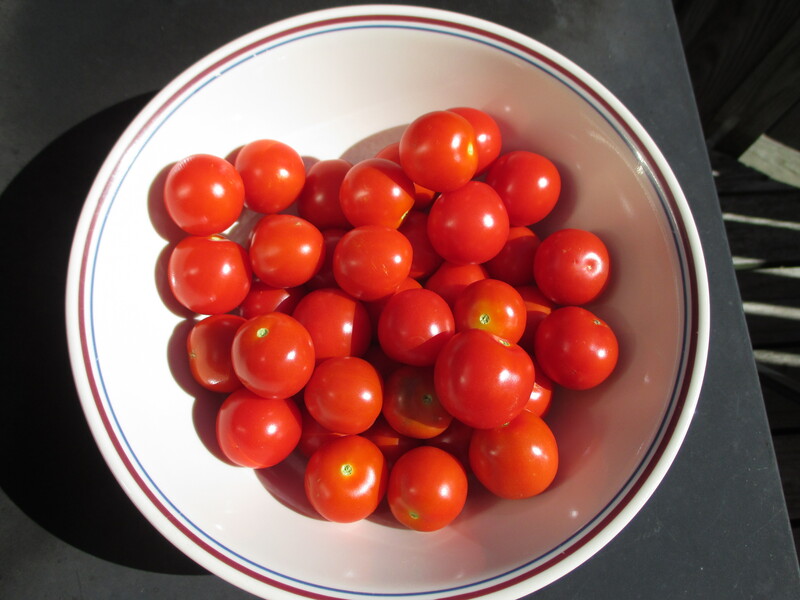 I picked these today–October 8th–our tomatoes continue to produce late into the season. Celery root (celeriac) is ready for the soup. 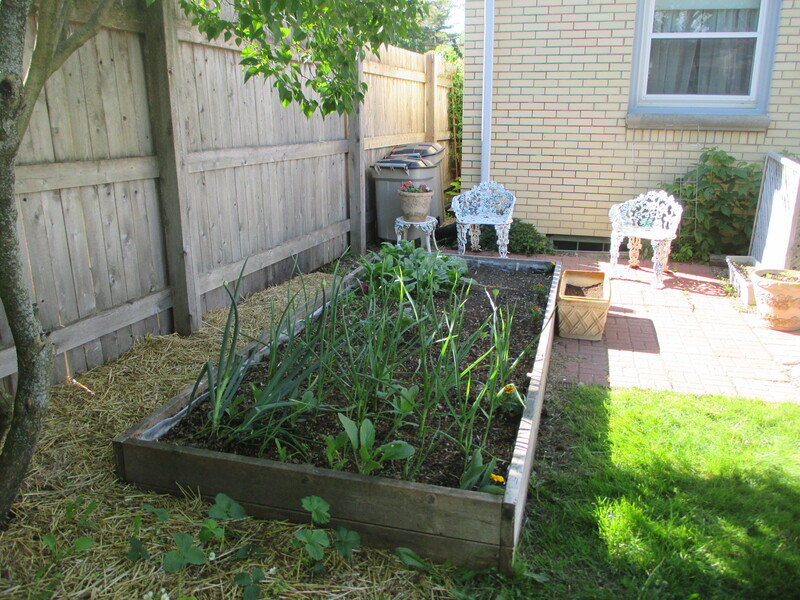 In this part of the garden, I have (from left to right) celery root, leeks and Swiss chard. 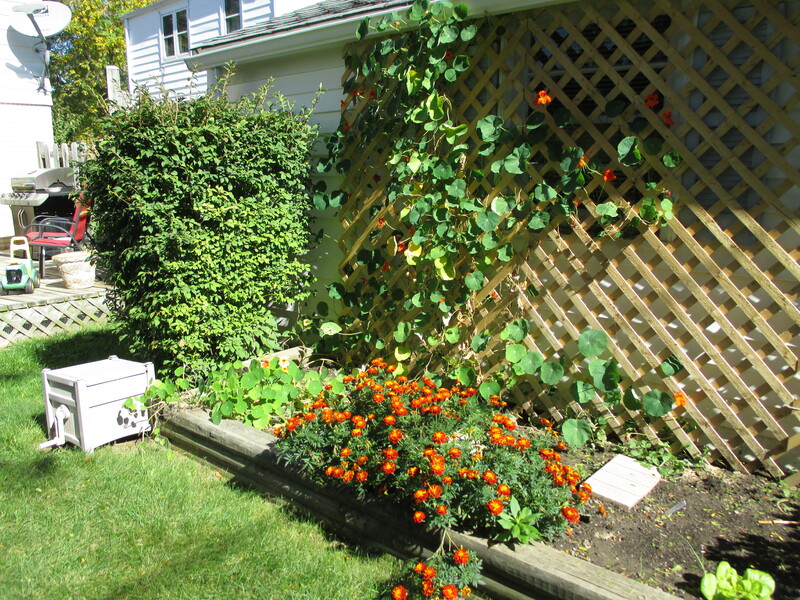 Marigolds and nasturtiums finishing out the season. They have added so much color. My daughter is picking raspberries. As you can see, my garden is still full. Plenty of herbs are available for flavoring meats, soups and sauces. 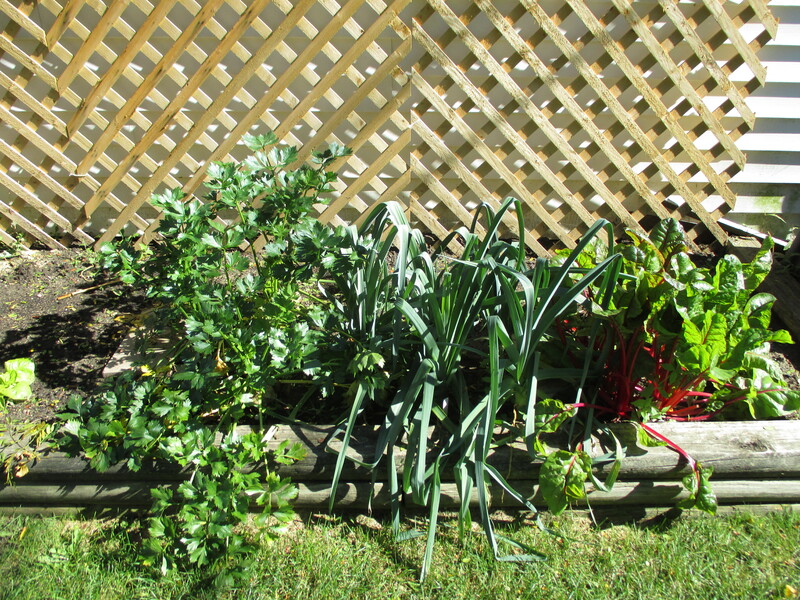 This garden bed is still going strong with strawberries (I admit they’ve taken over a bit), walking onions, celery, broccoli, carrots, kale and tomatoes. October 8th and it is all still looking great. 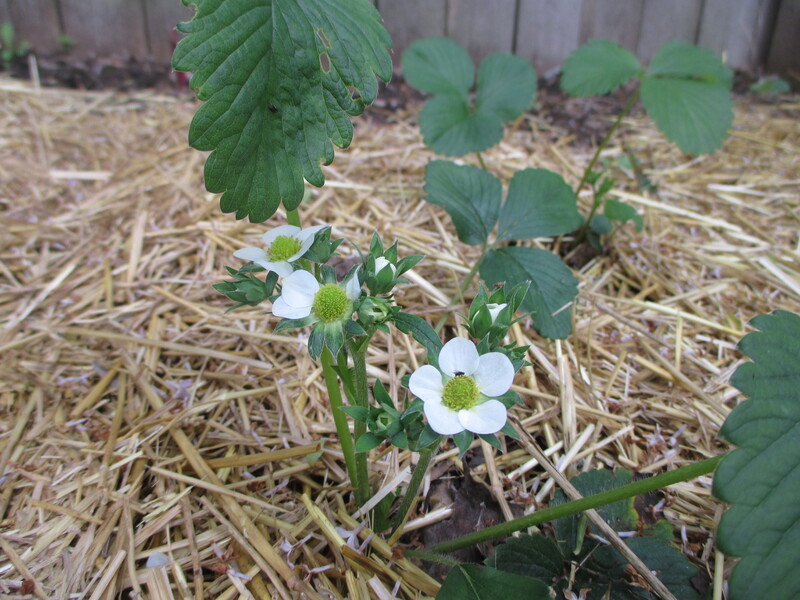 The strawberries have really multiplied, as you can see from this view. Every day we enjoy raspberries. 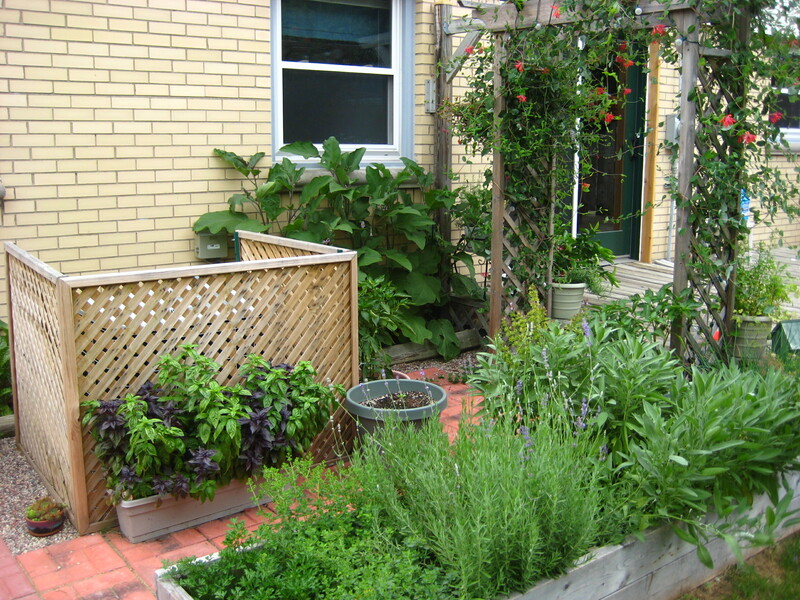 When we moved into this house four summers ago the only herb I’d ever grown was a small pot of basil. 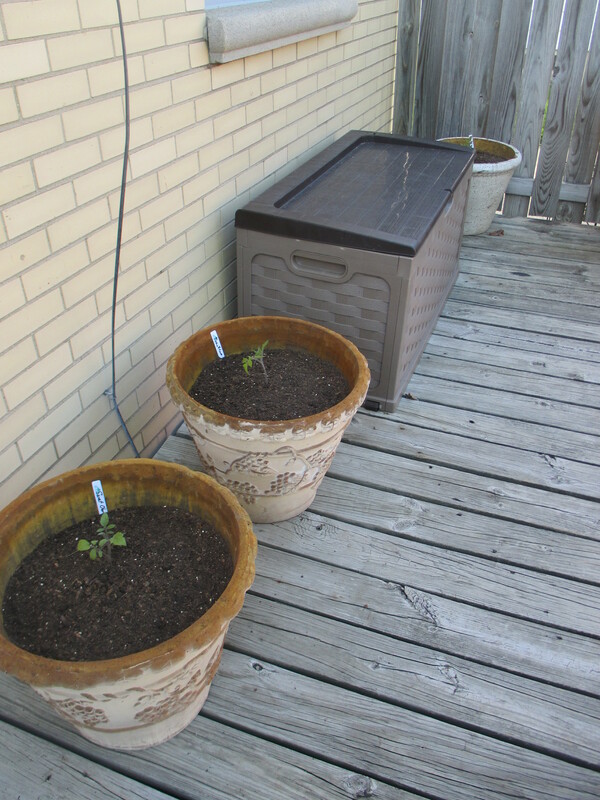 I knew that had to change, so the very first thing we did that next spring was install a raised bed specifically for growing herbs. 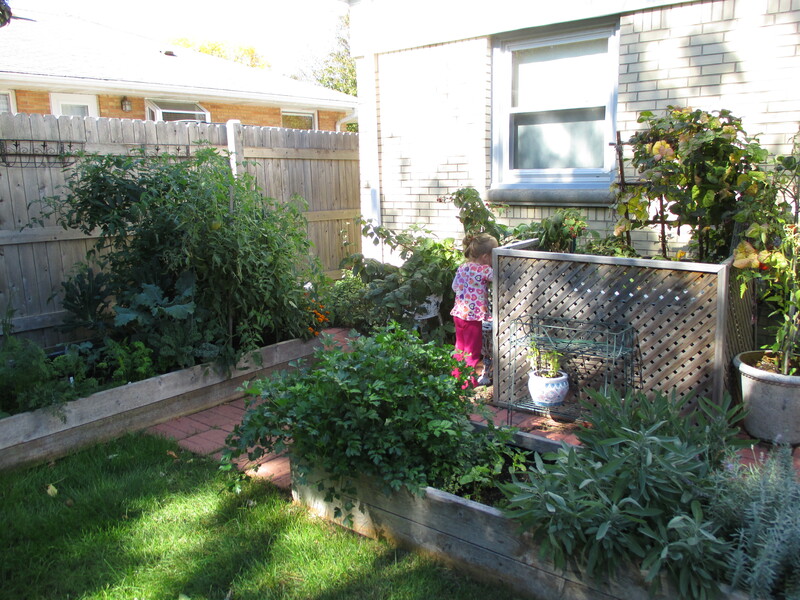 Construction of the herb garden was a priority when we moved in to our new house. Since that time I’ve really developed a love of herb gardening and especially a love of cooking with herbs. I can’t even imagine NOT having herbs now. Food would not be the same. This year I’m looking for even more ways to use my herbs. Since eating them is such a delight the natural next step would be drinking herbs. 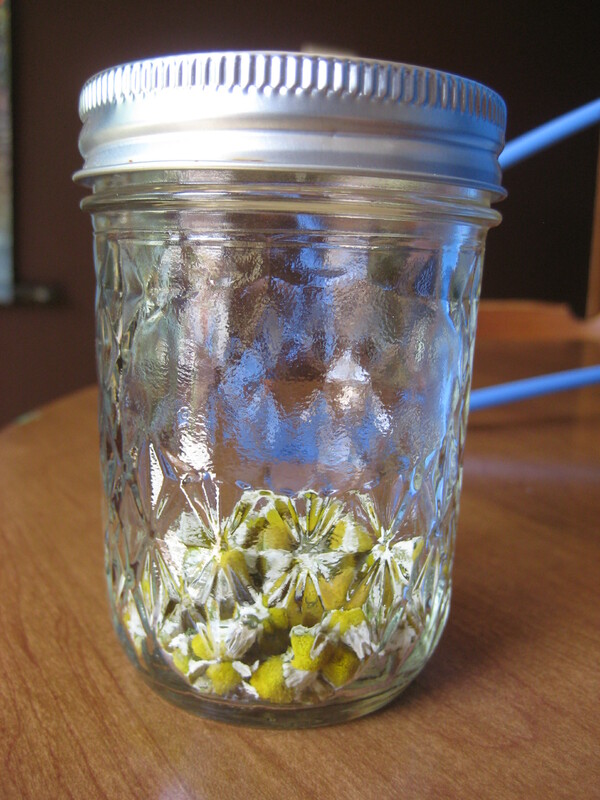 This past week my kids picked chamomile flowers for me so I could preserve them for chamomile tea. The process was simple. 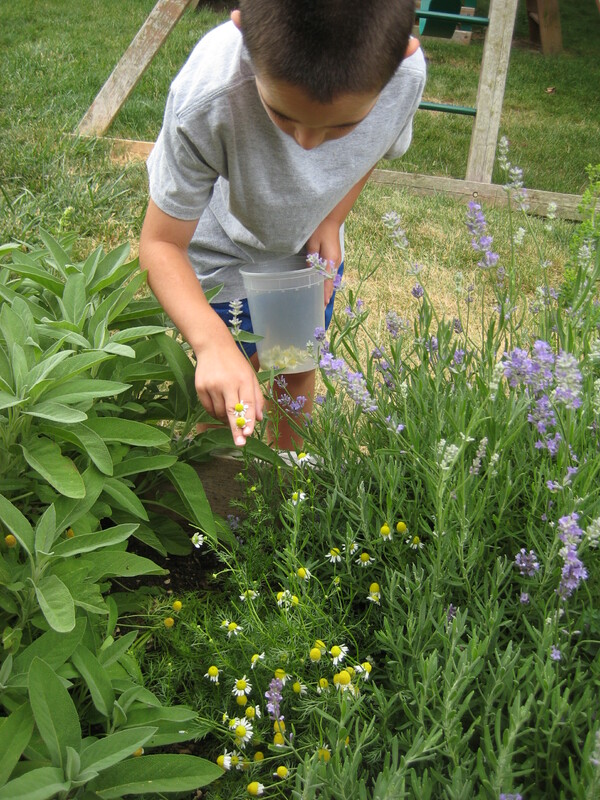 My son picking chamomile flowers. After soaking them in some salt water for 10 minutes to get the bugs off, I laid them out to dry on a towel. Once the water had evaporated off, it was time for the oven. I preheated the oven to 200 degrees then turned it off. I place the chamomile on a parchment lined baking sheet and put it in the oven for a few hours. When the oven was completely cooled again I took the sheet out, preheated again to 200 degrees, turned the oven off once more and put the sheet back in for a few more hours. 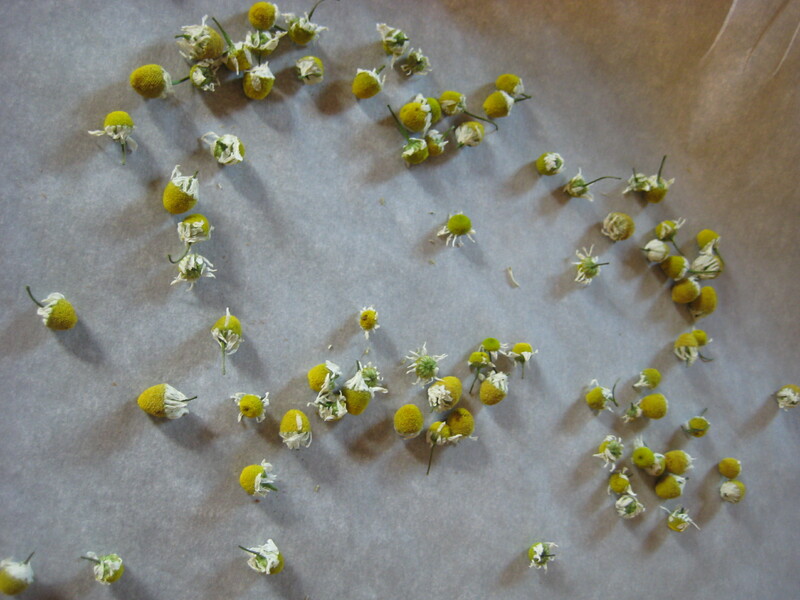 In all, it took about 4 hours to dry the chamomile. Dried chamomile ready to be put in a jar for later use. Then, all I had to do was put it in a jar with a nice tight lid and store it for a cool fall evening in the future. I do love time traveling food. As chamomile flowers continue to blossom on my plant I’ll continue the process and hopefully fill up my jar. The lavender was looking equally inviting this week so I decided to use it in a simple syrup recipe. 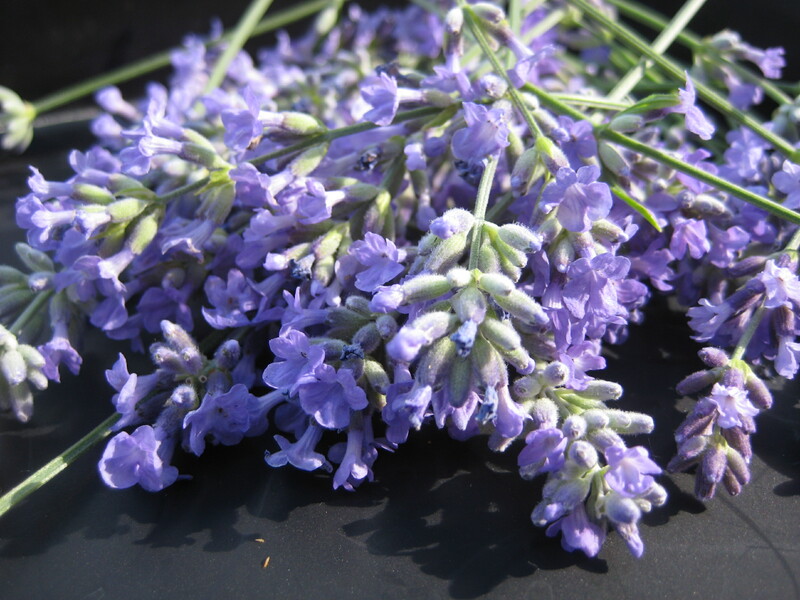 Lavender buds are best harvested just as they open. I carefully selected which stems looked the best and clipped those off with my kitchen scissors. Once in the house I used the same bug removing process that I did with the chamomile. Picked lavender, I used a couple teaspoons in the simple syrup. Just right for harvesting, some buds are open, some are not. 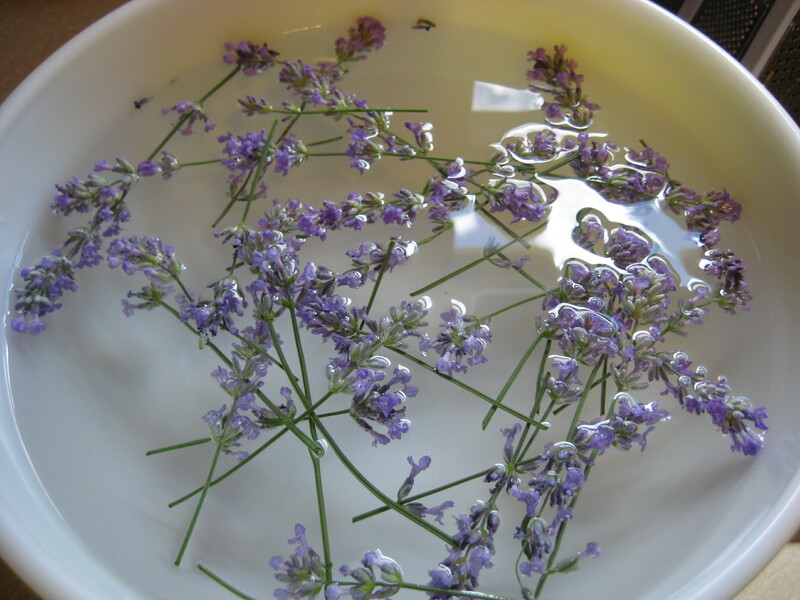 Soaking the lavender in salt water to remove bugs. 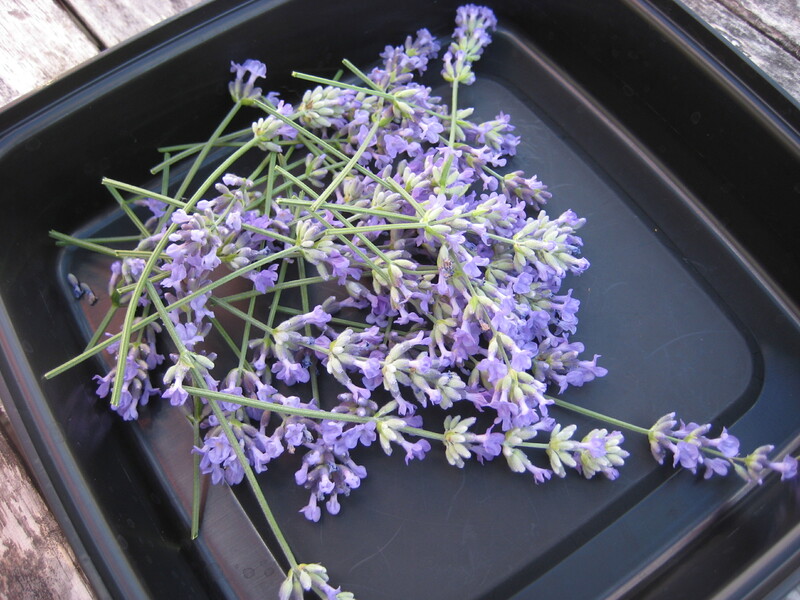 The next day, when the lavender was dry, I removed all the purple buds from the stems. To make simple syrup I combine equal parts granulated sugar with water and bring to a boil. To make a flavored syrup, I toss in whatever herb I’m using before I turn the heat on. This time it was the lavender buds that I put in. Once the syrup comes to a nice rolling boil, I turned it off and let the lavender steep until the syrup was no longer hot but just warm. At this point I take a coffee filter lined strainer and putting that over a container I pour the syrup through it so that the lavender buds are left behind and syrup drips through. The result is a nice clear lavender-scented simple syrup perfect for a cup of tea or a classy cocktail! I used mine with some rum and club soda for a refreshing summer drink. Yum! 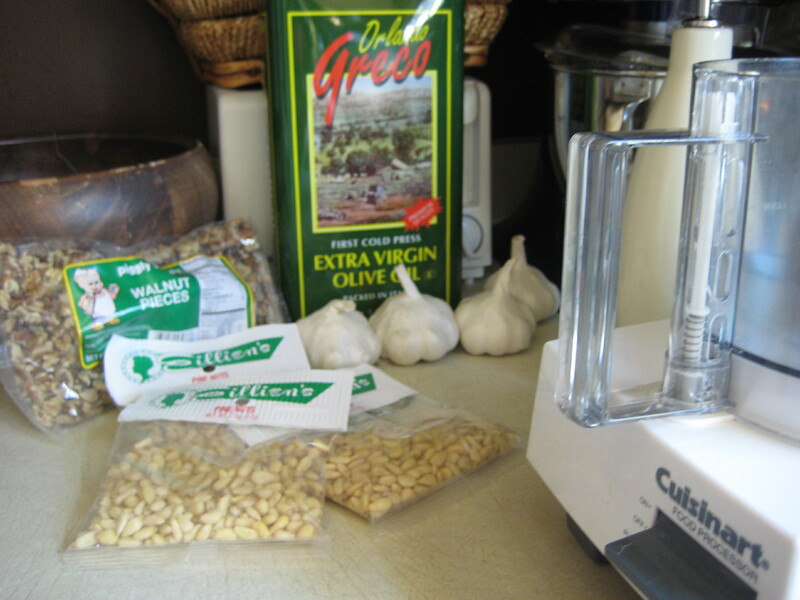 This process works great with all herbs. I’ve tried it with mint and the results were delicious. Makes a potent mojito or mint julep. My next herbal beverage project will be drying mint for mint tea. I have a very healthy chocolate mint plant that is ready to be harvested. The best time to harvest mint (and most leafy herbs) is just before it bolts and produces flowers. 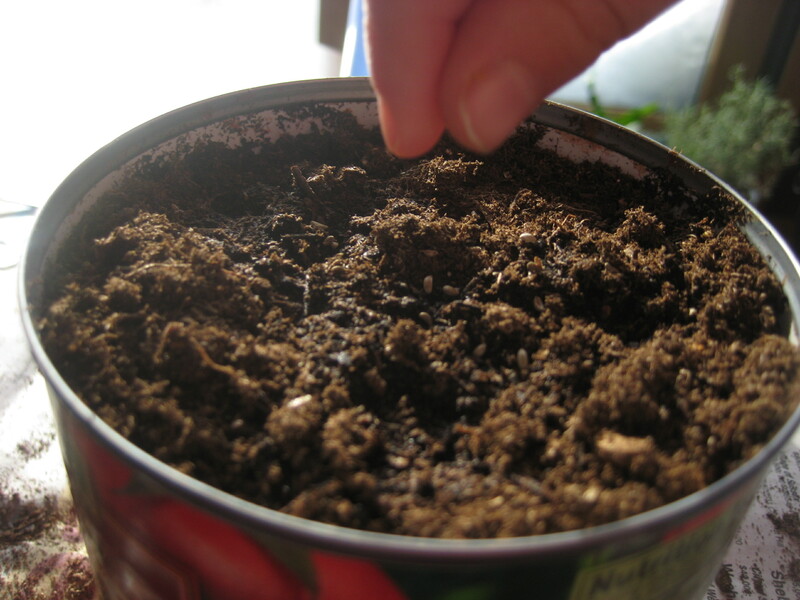 It’s nice to use a large quantity of mint too because cutting the mint actually keeps the plant healthy. 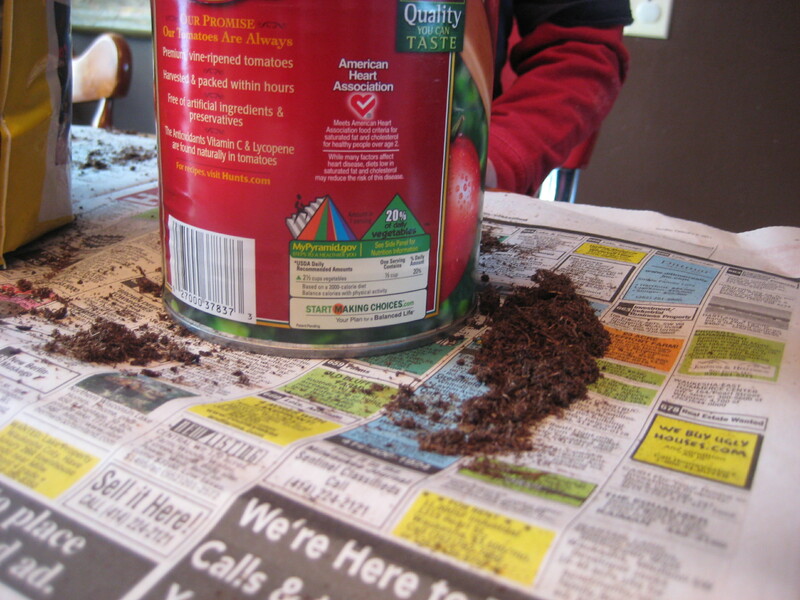 And I’d much rather use the mint to make tea than toss it in my compost. These are just a few ideas, there are so many ways to use herbs. Can’t wait to hear YOUR ideas! If you’ve got a good one, please leave a comment. Planning dinner six months in advance. 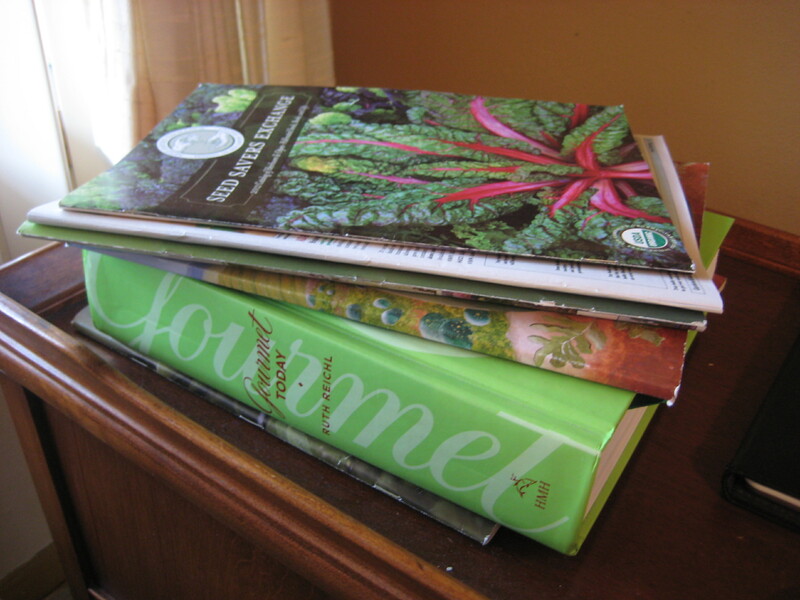 This time of year, you’ll see me with my stack of seed catalogs, but not far away is my stack of cookbooks and magazines for inspiration. 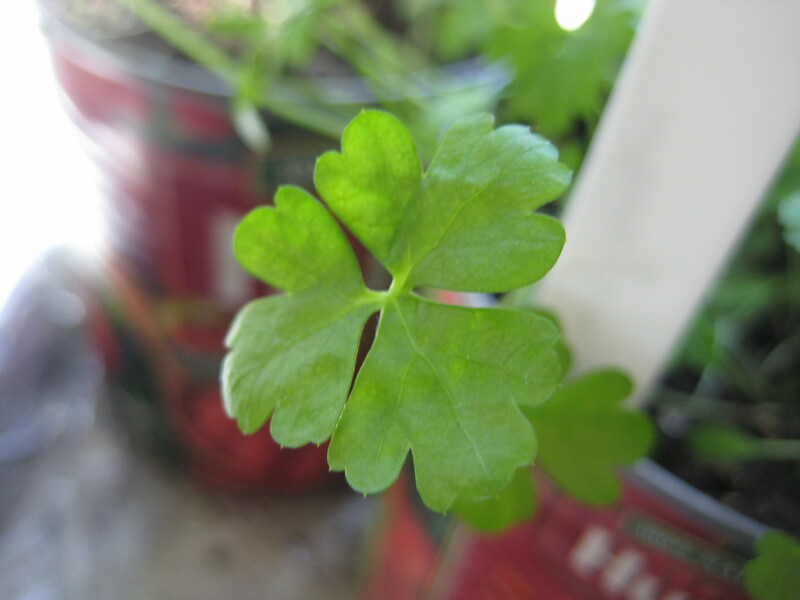 The reason I planted an herb garden a few years ago is that for years I had seen so many recipes in cookbooks and magazines that called for fresh herbs. And I wanted to make them! But fresh herbs cost a mint (pun intended) at the grocery store, and truth be told they really aren’t “fresh” inside those little plastic clamshell boxes anyway. 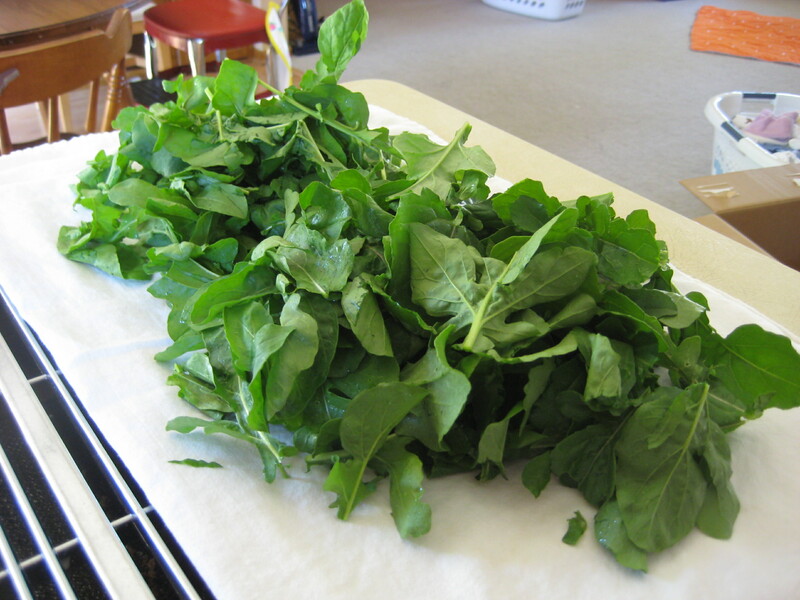 Grocery store herbs are reminiscent of fresh herbs, but lack the intense smell and flavor of freshly harvested herbs. 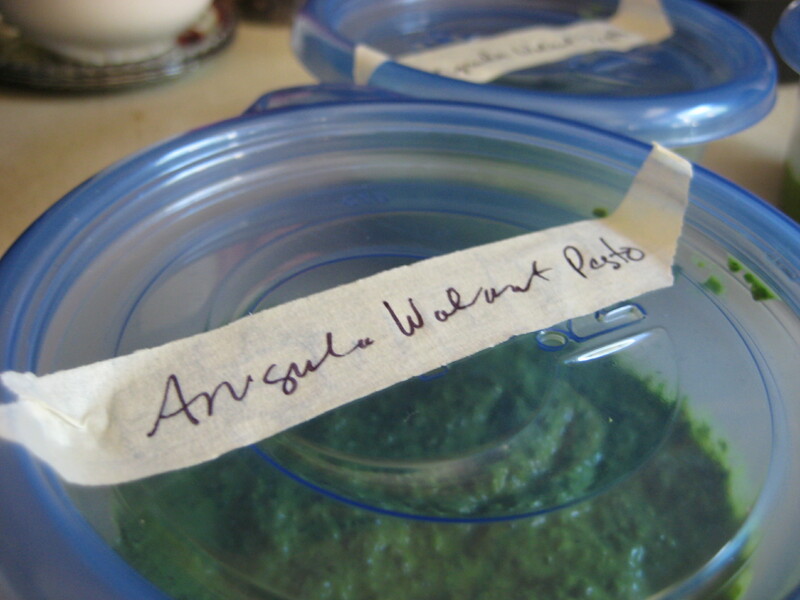 Because I love food–and because I love the people for whom I cook food–I had to grow my own herbs. I couldn’t go wasting money on mediocre (at best) grocery store herbs and I HAD to make those great recipes I was reading and collecting. Now I like to go back and page through my cookbooks or magazines and think about what we’d like to try in the coming year. I see a great looking beet salad and I make a mental note to choose beet seeds that will be perfect for that. Eggplant recipes have inspired me to grow a few different varieties. 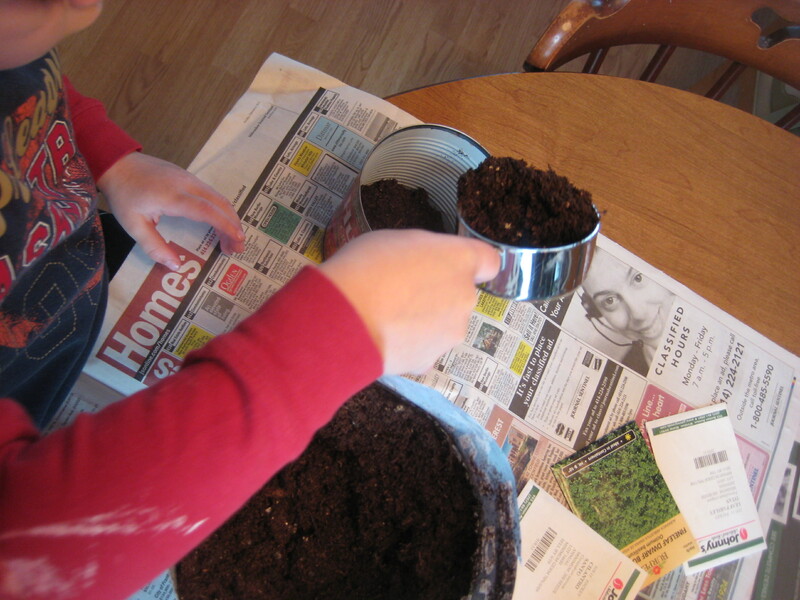 When thinking about what to plant, it helps to think about what I will cook. Last year I added tarragon to my herb bed. How have I lived without tarragon my whole life? I was inspired by recipes to add this and now I cannot imagine summer grilling without it. 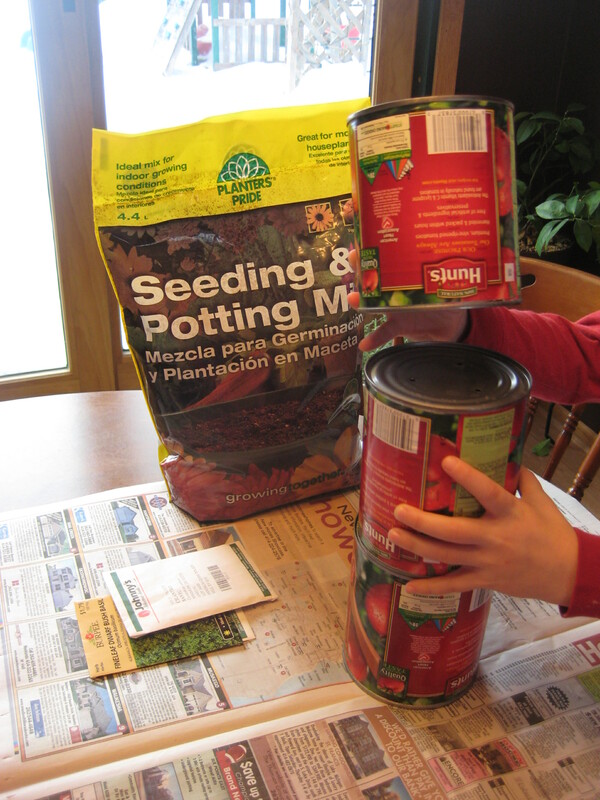 So I’m looking forward to trying some new recipes this growing season and in preparation I’m going to be ordering the needed seeds. I think of it as planning for dinner six months in advance. Might seem a bit extreme to some, but to me it’s much less extreme than my herbs and veggies traveling thousands of miles to end up on my dinner plate. 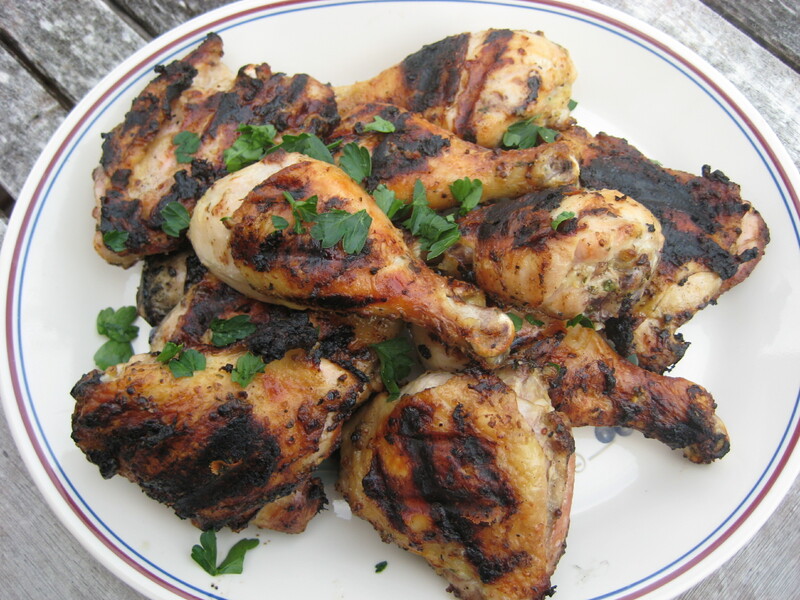 A little advance garden planning makes it easy to throw together delicious meals during the growing season, such as this grilled chicken marinated in herb mayonnaise with fresh herbs. It’s the second to last day of March (a month that was more lion than lamb) and I’m kicking off my Garden to Table series with two delicious side dishes. I have, in fact, harvested some parsley and basil from my indoor garden. 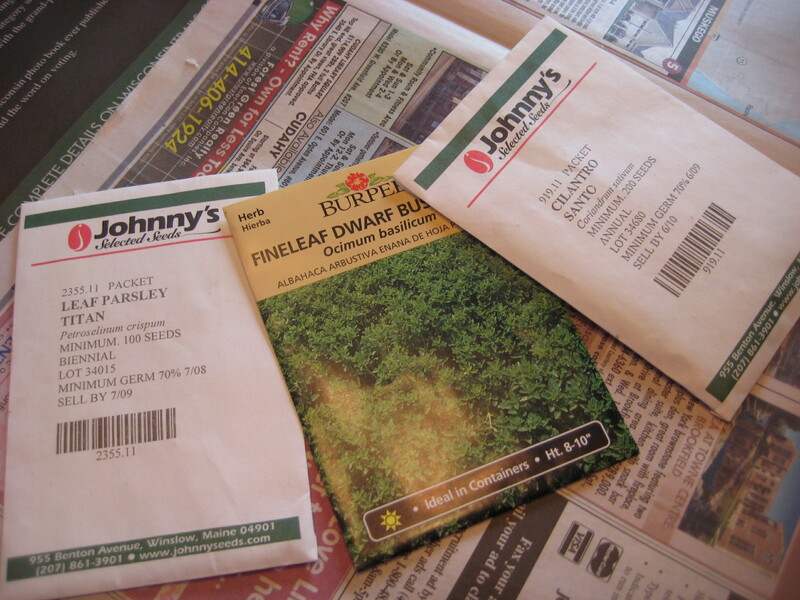 While they are a drop in the bucket of what will inevitably be an herb filled growing season, they are so very welcome! I’m thrilled to share this dish with you as it is absolutely delicious. Bon Appetit readers will recognize this recipe from the most current issue of the magazine, April 2011. I couldn’t resist such a simple but satisfying example of how even the most meager use of fresh herbs can dress up something like a chickpea in way that makes it sing. Basil leaves of the bush basil plant I started in February. 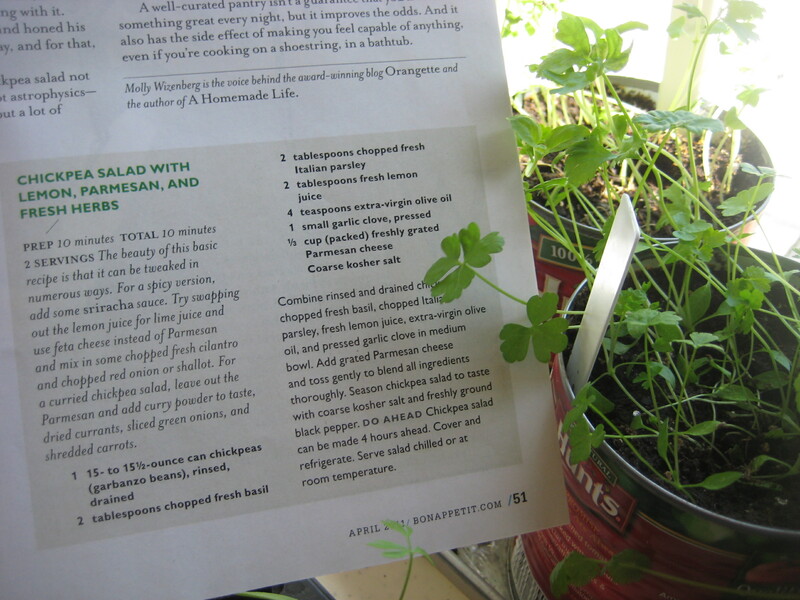 Parsley, plants are still small but there are enough leaves to add flavor to this dish. Who knew chickpeas could be so satisfying? Notice how the fresh herbs punctuate this dish. 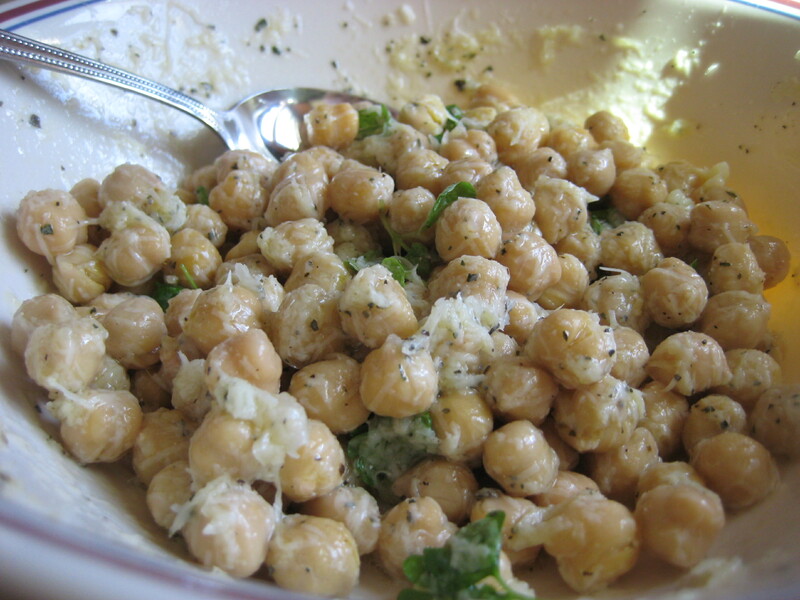 Here is where you can find the chickpea recipe: Chickpea Salad with Lemon, Parmesan and Fresh Herbs. The second item I used today from my garden was carrots. Carrots? In March? Why, yes. It’s a fact that carrots, if stored properly, can remain sweet, crispy and fresh for months… in this case half a year. I only had a few left so I shredded them and put them into a crunchy Asian style coleslaw. I learned to make this coleslaw using a Betty Crocker cookbook. It works every time, even when I’m missing an ingredient here or there. Today I was short the green pepper, so I just left that out. Carrots harvested in September become March's coleslaw. These two side dishes will be served tonight alongside some grilled Italian sausages. It’s pretty cold outside–mid-30’s!–but that doesn’t stop a true Wisconsinite from grilling sausages. It wouldn’t stop me from grilling veggies either! Since Betty doesn’t share her coleslaw recipe online, I’ve typed it out for you here. It’s so good! 1. Place cabbage, carrot, bell pepper and onions in large glass or plastic bowl. 2. 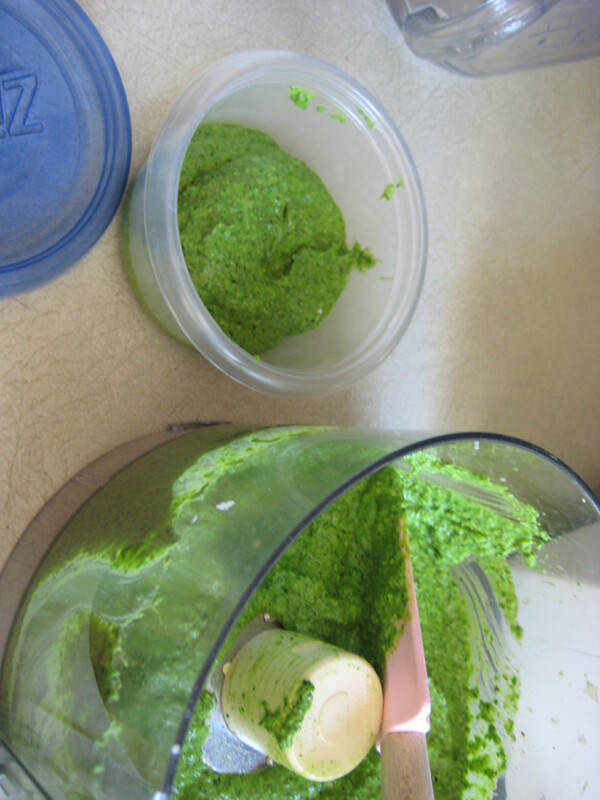 Shake remaining ingredients in tightly covered container. Pour over vegetables; stir. Cover and refrigerate at least 3 hours, stirring several times, until chilled. Serve with slotted spoon. Store covered in refrigerator. Happy Cooking! And don’t be shy if you have recipes or ideas to share throughout the season. I welcome links to recipes in the comments area or at my Twitter account @AGraciousGarden. 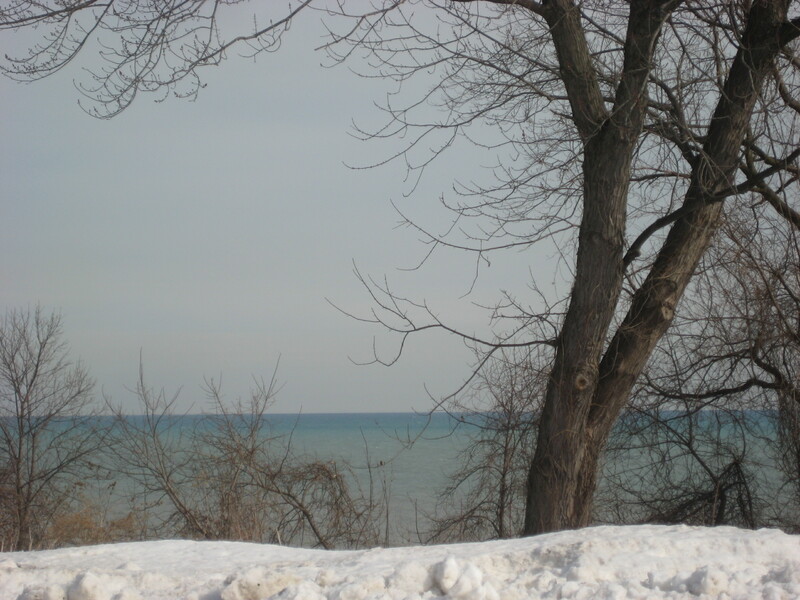 Photos from the third week of February. 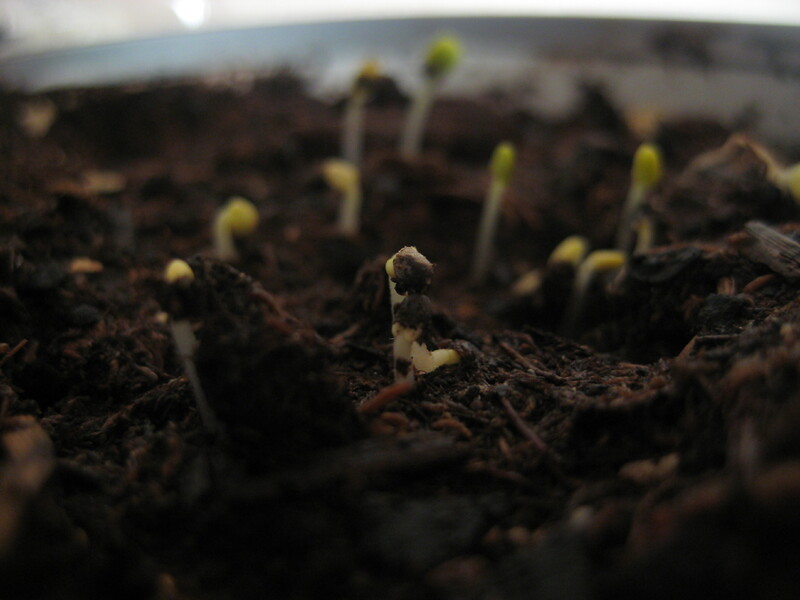 Early in the week, seeds began to sprout. 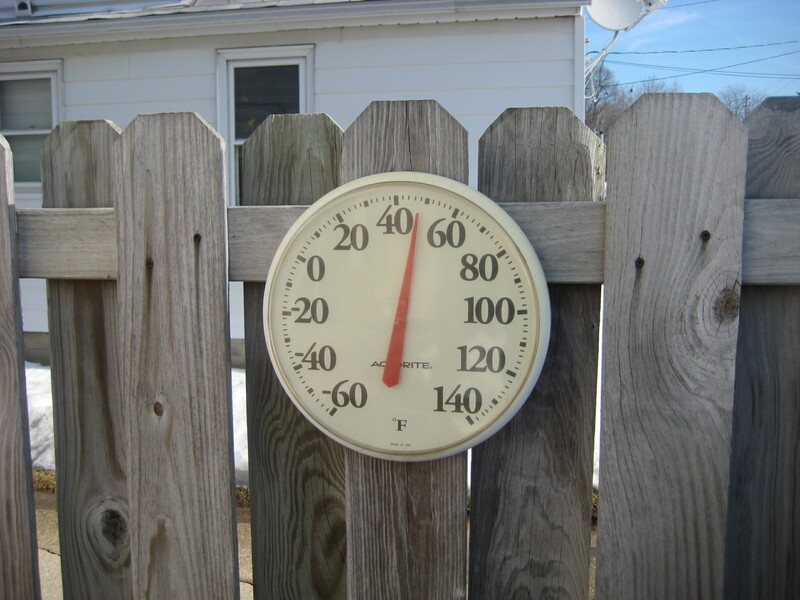 On Wednesday, the temperature started to rise! 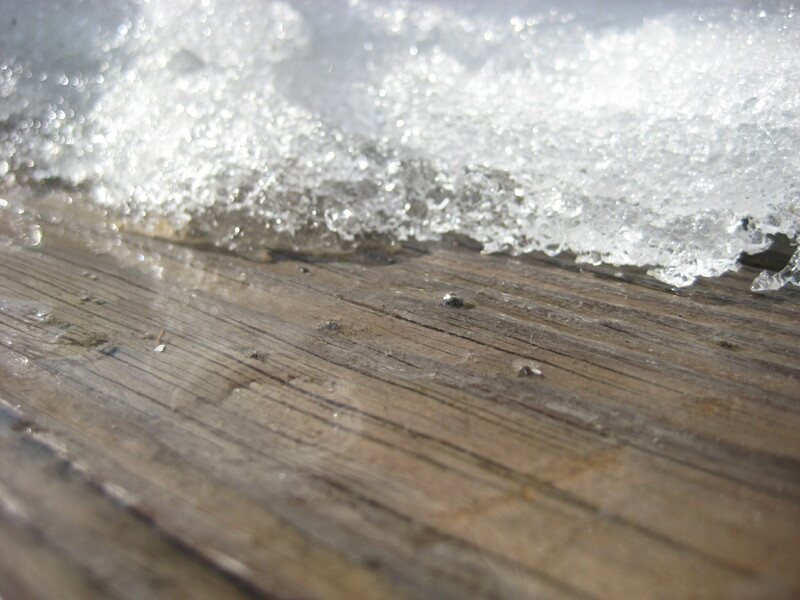 Snow retreated and revealed our long lost deck. 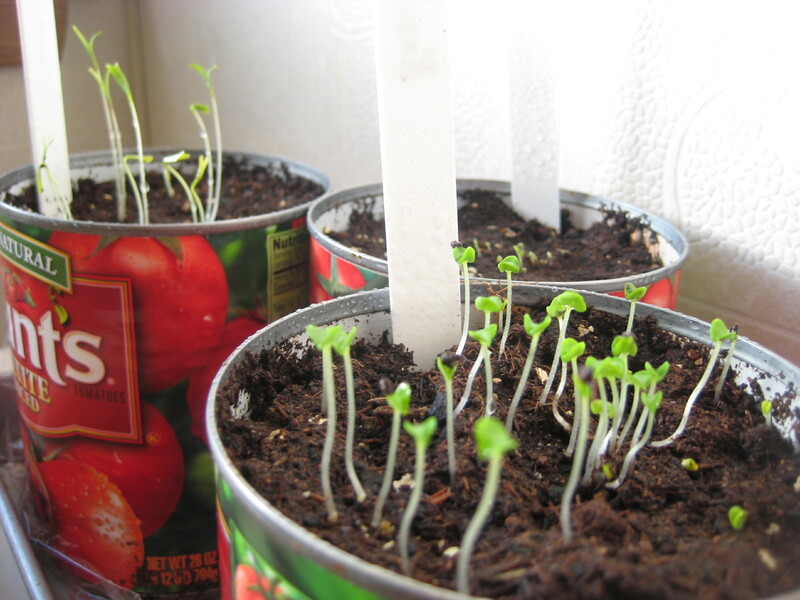 By the end of the week, the herb seedlings are really looking great. What a difference a year makes. The span of time between putting my first herb seedlings into a freshly filled raised bed and harvesting from second year plants is relatively brief–just over one year. But for an herb, that one year makes the difference between infancy and adulthood. 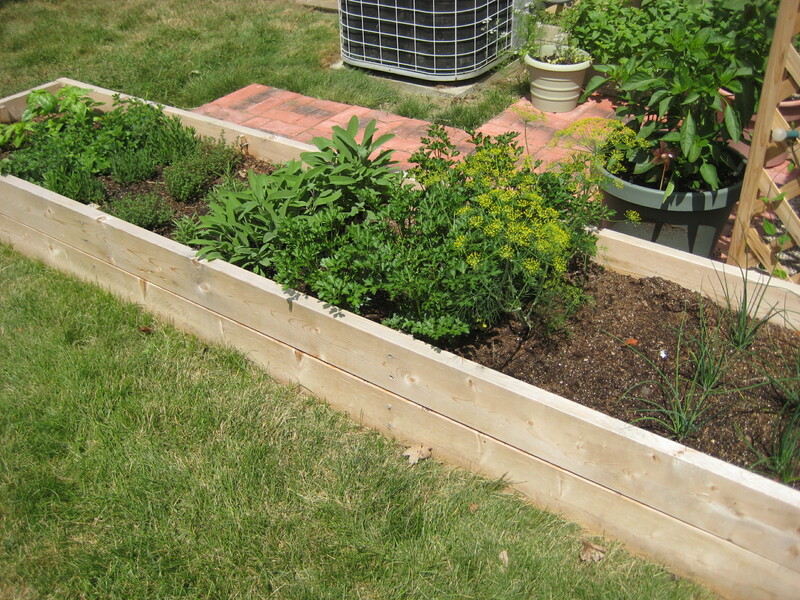 In spring of 2009, I recruited my husband to build a raised bed to be used specifically for herbs. Only 18 inches wide, it’s easily accessed from either side, and herbs have room to spill over the sides if necessary. 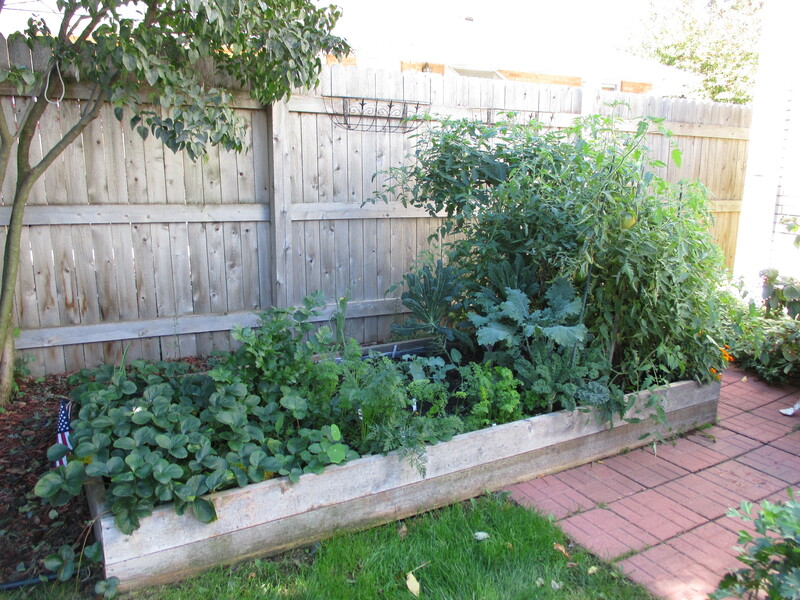 It also provides a nice border for the small patio garden where most of my garden grows. 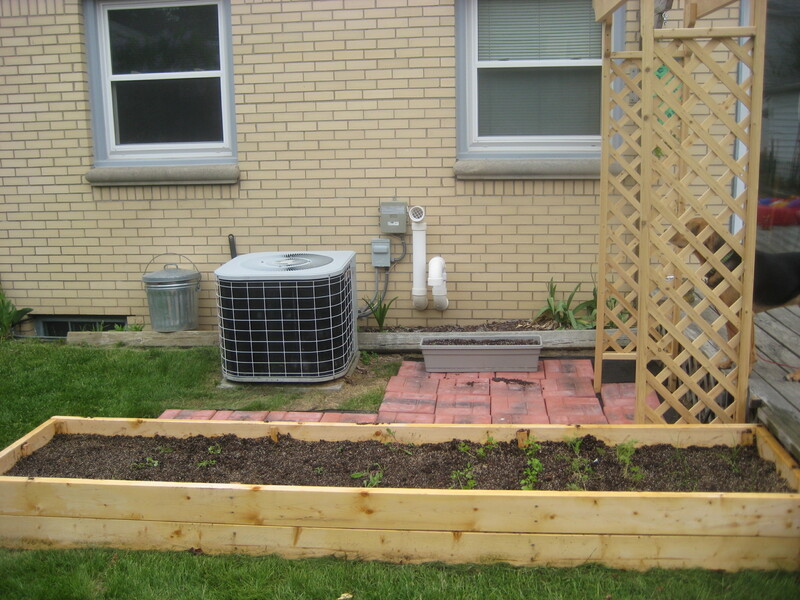 Newly built raised bed with seedlings. 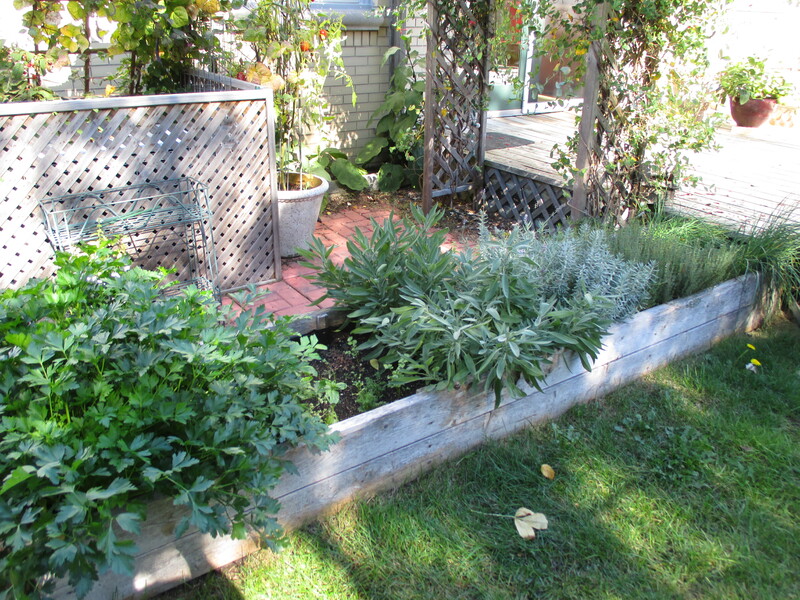 In 2009, I planted parsley, chives, dill, sage, rosemary, thyme, lavender, oregano and basil in the raised bed. All grew, though some did better than others. The rosemary never grew taller than six inches, and remained thin. The dill did fine for a few weeks but seemed to go to seed very quickly, and since I did not sow a second or third crop we didn’t have any by the time other veggies were ready to harvest. Overall, I was pleased with the abundance of parsley, chives, sage, lavender and oregano. That summer I came to know the herb garden and all of it’s smells and flavors. First year herb garden mid-season. But it was the following year in which the herb garden really came into it’s own. Early spring saw chives shooting up through the snow. Soon after, tiny green leaves began to grow on what looked like dead wood of thyme, oregano, sage and lavender. Rosemary and parsley did not survive the winter. It’s just as well. I found a new spot in the bed for the parsley and moved rosemary to a pot where it has been much happier. Now the rosemary can come inside with me for the winter and be used in winter soups and sauces. 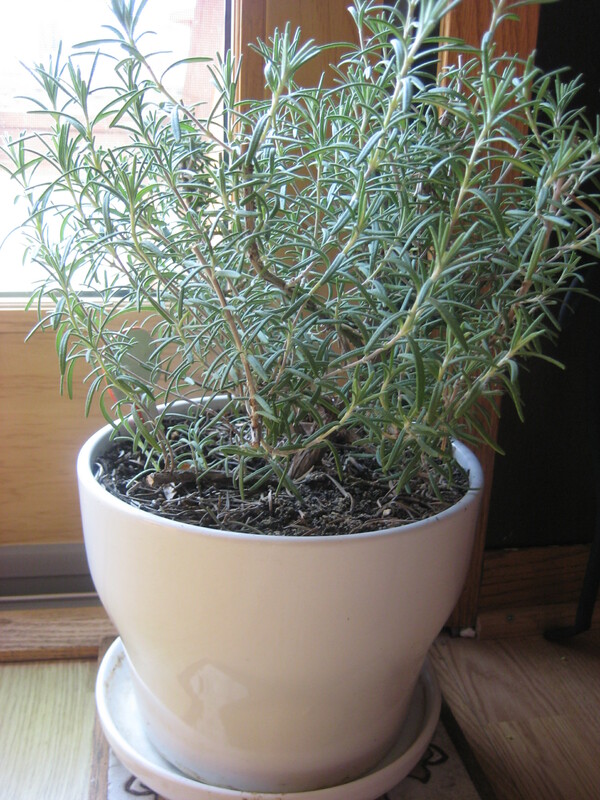 Potted rosemary can live indoors or out. Year two was one of pruning back. The sage became huge, almost tree-like in the way it became thick and woody, stems reaching all over the place. Chives needed constant cutting. In fact, by the end of the season I removed three plants, knowing I wouldn’t need them next year. This could free up space for something new. The best part of the herbs’ second year was the beautiful flowers. All edible, all beautiful. And they attracted the most interesting insects and butterflies to our garden. I can’t wait till next year when the flower show begins again. Herb garden, year two. 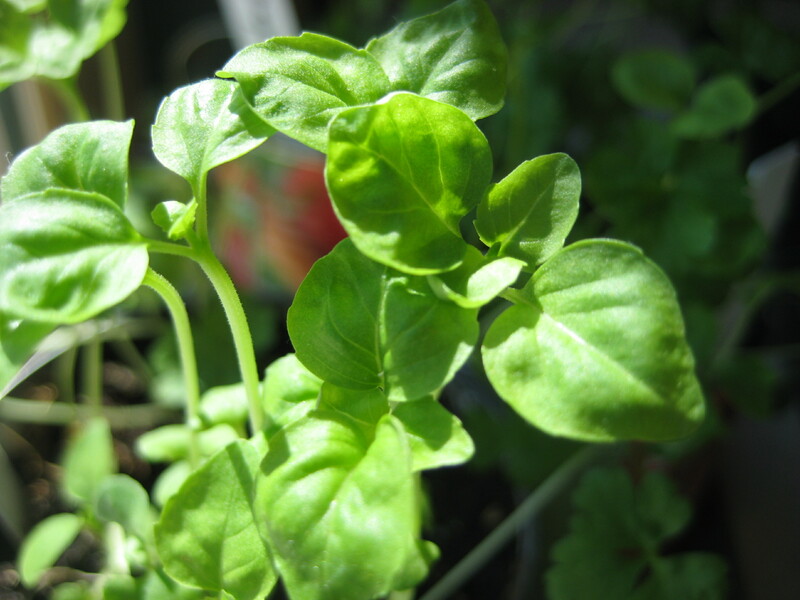 Basil in nearby container. 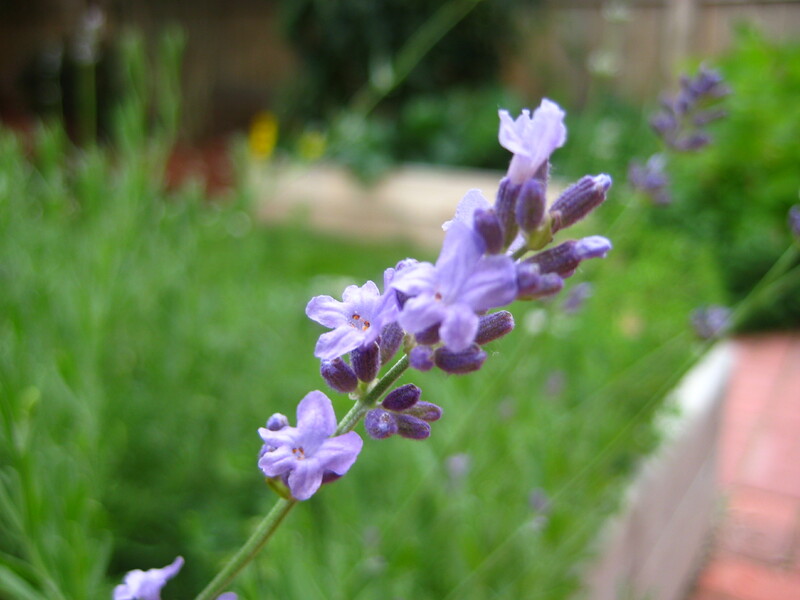 Lavender flowers delighted us all season. 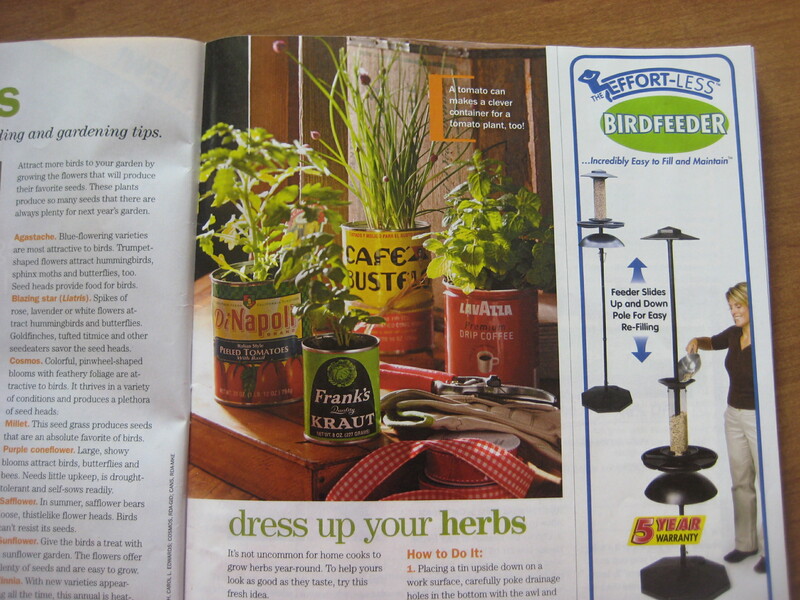 I wonder what the herb garden will look like in its’ third year? Will it overgrow its small space? Will plants come back just as healthy? Will I need to replant anything? I especially wonder about that parsley. Biennial, it should come back this spring if conditions are right. Time will tell how the herb garden will grow. 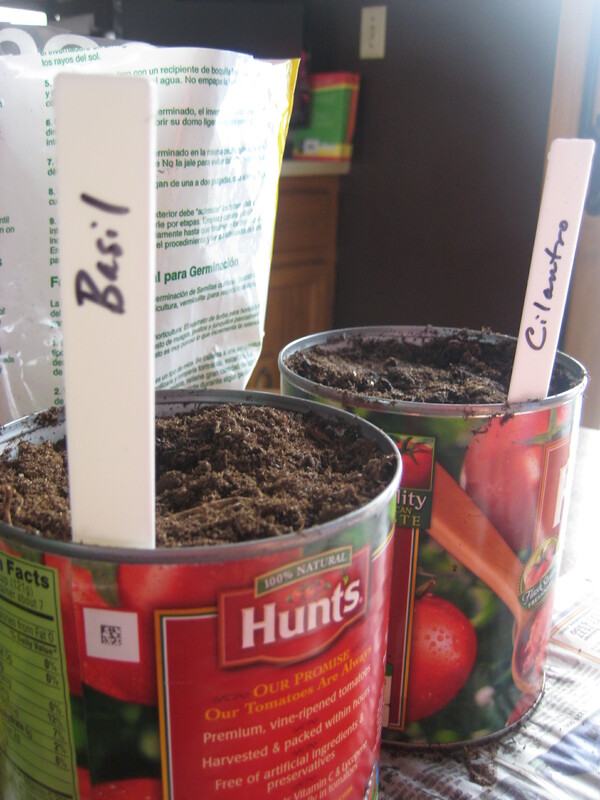 After two years with it, I know this: I’ll never have a home without an herb garden again. 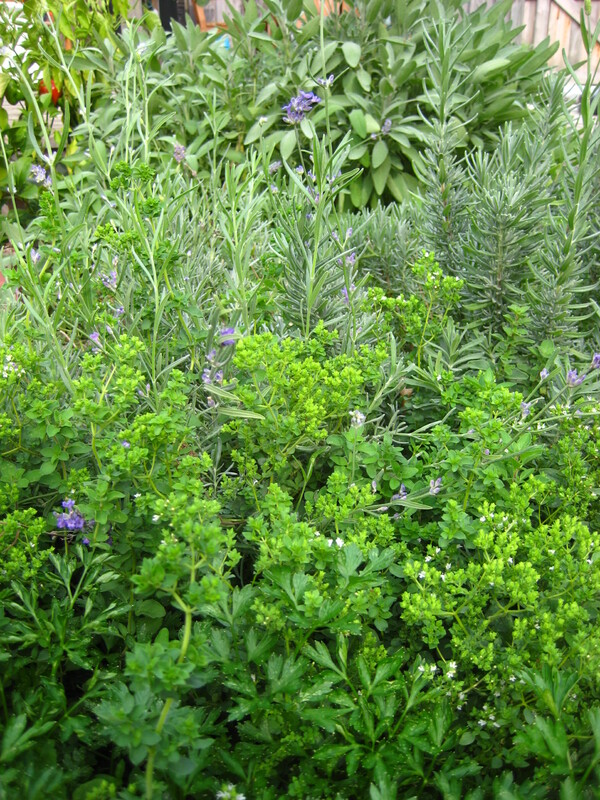 Herbs brighten up our food, look and smell great in the garden and are a conversation piece for guests to our home. They attract butterflies and hummingbirds. 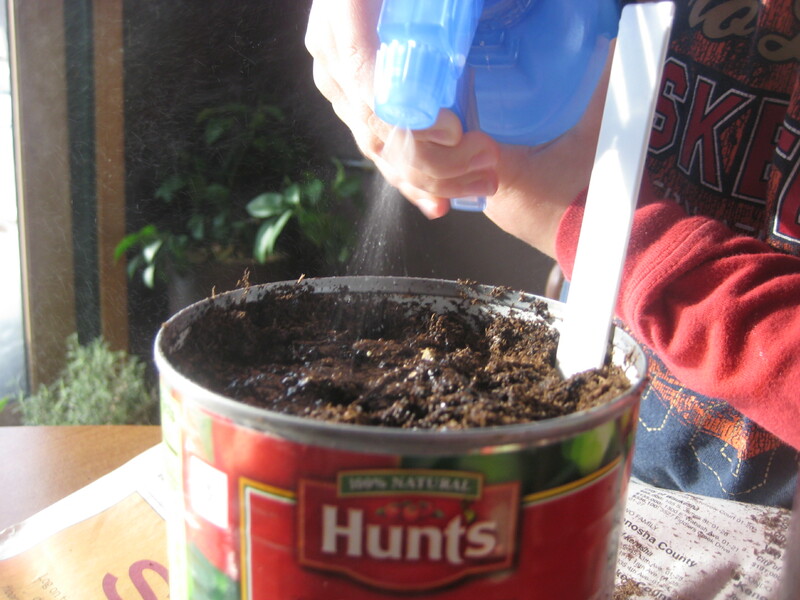 My kids can’t help but grab an herb and munch on it while they play outside. We’ve come to appreciate our herb garden more than we could have imagined when we first set out. I simply love my herb garden.